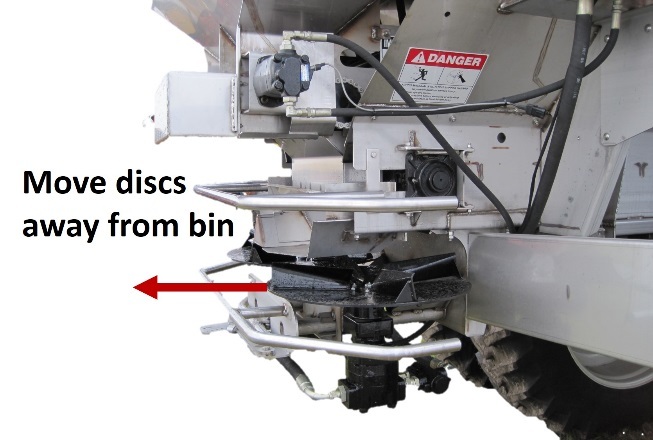 This publication is the second of a three-part series on spinner-disc spreader operation. This series provides insights into proper operation, calibration, and spread uniformity assessments of commonly used spinner-disc spreaders. Spinner-disc spreader applications need to be as uniform and accurate as possible to minimize spread variation during field operation. In order to achieve expected application accuracy with spinner-disc spreaders, proper calibration, set-up, and spread pattern correction is required. This publication focuses on how to assess spread pattern uniformity and deal with irregular patterns and correct them. 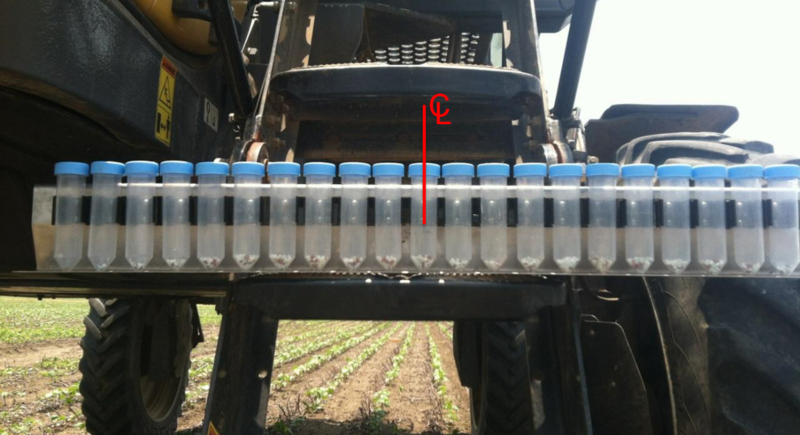 Figure 1 illustrates that calibration, maintenance, and set up of spreaders are important components in preparing the application equipment for accurate fertilizer application. After conducting a standard pan test, refer to this document for correcting spread patterns to achieve a uniform application rate. See Part 1 of this three-part series for more information on calibration of metering devices, as well as standard pan testing procedures. Part 3 provides definitions for terminology used in this series as well as important operational tips and considerations. 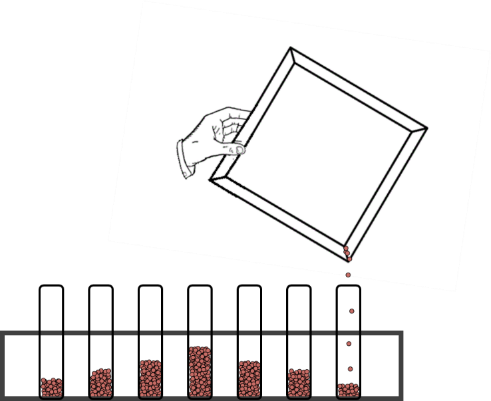 After collection, material from each pan is then poured into its corresponding test tube in the rack, as shown in Figures 3 and 4. The amount of material in the test tubes (approximately 100 ml size tubes) provides a quick, visible evaluation of the spread pattern. Make sure to weigh the fertilizer from each pan so that an accurate spread pattern can be assessed. If a test tube rack is not available, this concept can also be shown graphically in Excel or a similar spreadsheet package (Figure 5). 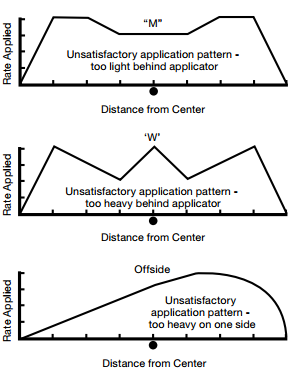 After converting the amount of material into an application rate, distribution patterns can be plotted and reviewed to evaluate spread uniformity (Figure 5). If the spread pattern is symmetrical across the swath, and the proper swath width is used, the material will be deposited uniformly across the field. 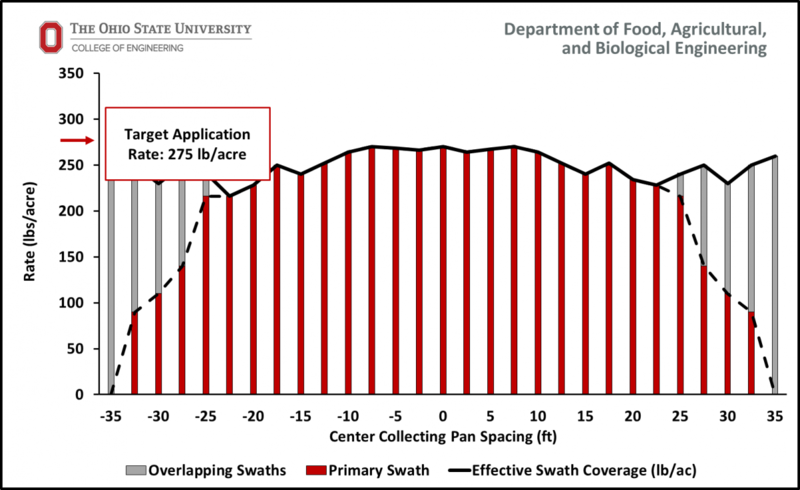 The effective swath width can be determined using the spread pattern. More information is provided below on typical swath patterns and correcting irregular patterns. Figure 5: This image displays collected materials from both the primary swath (scarlet) and the neighboring, overlapping swaths (gray). This is a typical pattern one might expect from a double spinner-disc fertilizer spreader. This pattern is considered desirable as it mirrors a flat top pattern (Figure 6). 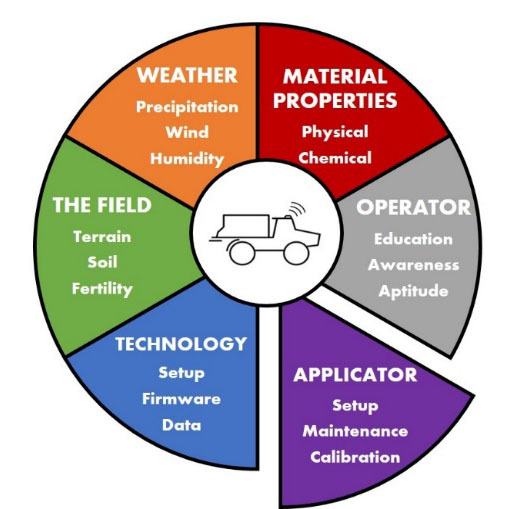 Spread patterns for a dual spinner-disc, dry fertilizer applicator can be classified into six different types (Figure 6). 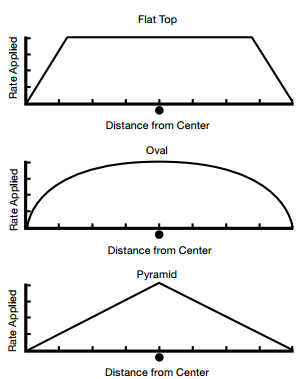 The flat top, oval, and pyramid patterns (Figure 6a) are acceptable patterns. Pyramid patterns are acceptable, but require double the number of passes to achieve uniformity. All of these patterns ensure field-scale uniformity and eliminate “streaking” across a field patterns if using the correct swath spacing. Figure 6b represents poor spread patterns that can occur with spinner-disc spreaders. Common undesirable spread patterns are the M, W, and skewed (or lopsided) patterns. If one of these unsatisfactory spread patterns are found during pan testing, then adjustment of spreader settings is required. Figure 6: Commonly observed spread patterns. Patterns presented in column (a) are acceptable while patterns in column (b) require an adjustment or spreader maintenance to be acceptable and provide uniform spread. Adapted from ACES (Fulton & Ogburn, 2010). If an undesirable spread pattern is measured, the next step is to adjust the spreader setup to obtain a uniform spread. Adjustments should be performed one at a time, and pan tests conducted after every adjustment to ensure the effect on the spread pattern is known. Make sure the spreader has been properly maintained and any worn parts replaced; especially check spinner disc and blade wear. 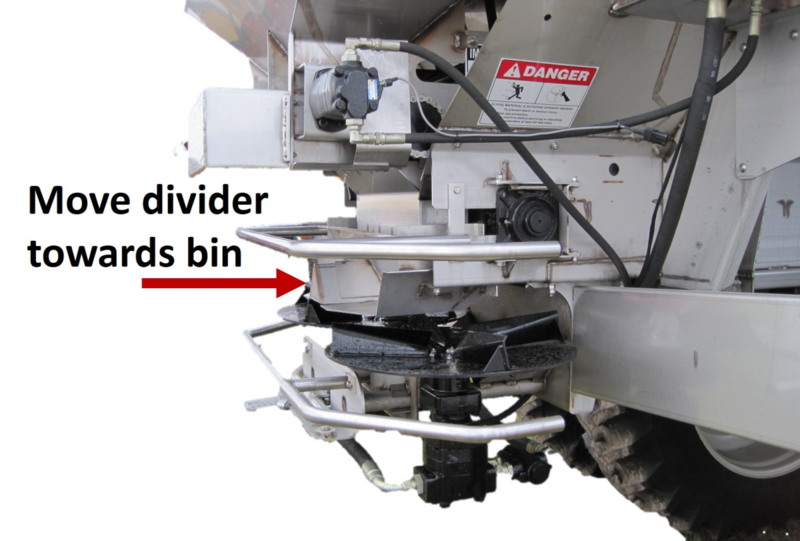 Spreader adjustments differ between spinner-disc spreader manufacturers so make sure you have thoroughly reviewed the operator’s manual and understand the possible settings to adjust in order to change the spread pattern. The following outlines adjustments to three types of spinner-disc spreaders, commonly used in the United States, using different methods to modify the spread pattern. It is crucial to understand which type of adjustment method your spreader uses. TYPE 1: Move divider assembly relative to spinner discs. TYPE 2: Move spinner discs (fan frame) while divider remains fixed (e.g. New Leader). TYPE 3: Adjust deflectors on divider or spinner-disc speed (e.g. GVM). After determining the method of adjustment, various iterations of spread pattern adjustments can be made until the desired level of uniformity is reached. Below are suggested machine setting changes that can be made to correct non-uniform patterns. Remember to consult the operator’s manual for brand specific adjustments. TYPE 1: Move flow divider assembly relative to spinner-discs (fan frame). 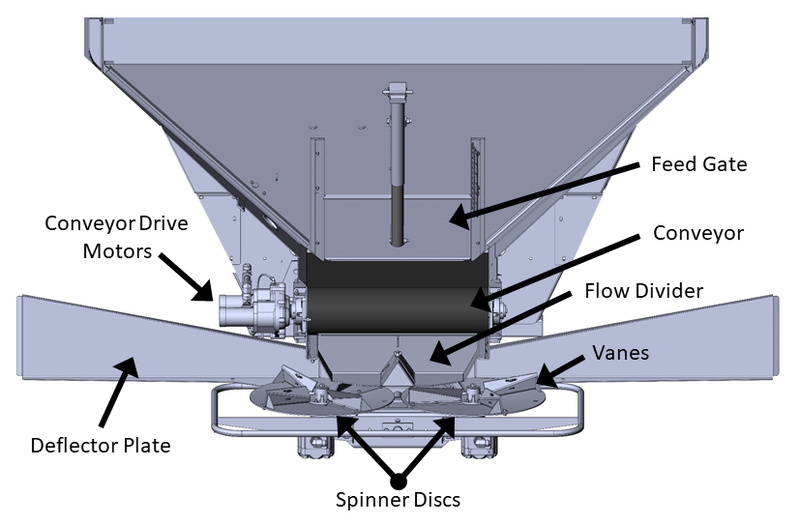 Move the flow divider assembly toward the bin to change the point of material delivery closer to the outer edge of spinner-discs (Figure 7a). Move the spinner-disc blade tips in the opposite direction of spinner rotation (Figure 7b). Gradually increase the spinner speed. However, use caution because very high spinner speeds can shatter fertilizer granules leading to uneven distribution. Figure 7: Dual spinner-disc fertilizer spreader Type 1 adjustment recommendations (a) and (b) for corrections of an observed M-pattern. Check that delivery chute is not broken or incorrectly set. 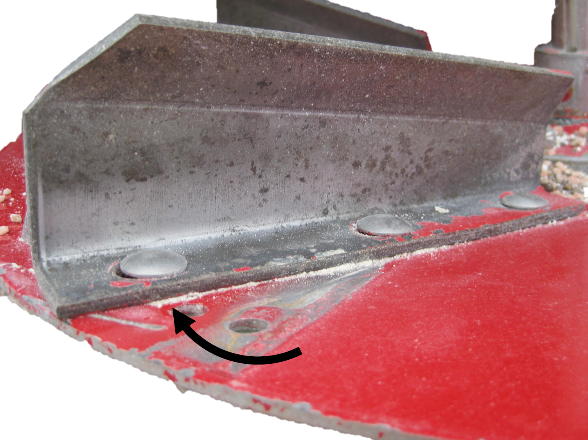 Check for improperly spaced or highly worn feed gate allowing fertilizer to apply heavy rates in the middle of the swath. Ensure no damp fertilizer material that sticks to the conveyor and misses the spinner-disc as it drops at rear of the spreader. Check chain tension as improper chain tension can cause fertilizer to miss the spinner-discs and fall in the center of the swath, causing heavy application. After correcting the reason for heavy deposition of product directly behind the applicator, the ‘W’ pattern will become an M-pattern. Then, revert back to the section on M-pattern adjustment for more information on how to adjust the M-pattern into a desirable application pattern. Check for improper metering of the product onto the dual spinners; more material flowing to one disc. Ensure there are no speed differences between the discs; check RPM with tachometer. Check for an improperly adjusted flow divider. Move the spinner-disc/fan frame away from the bin to change the point of material delivery closer to the outer edge of the spinner-disc (Figure 8a). Move the spinner-disc blade tips in the opposite direction of spinner rotation (Figure 8b). Figure 8: Dual spinner-disc fertilizer spreader Type 2 adjustment recommendations (a) and (b) for corrections of an observed M-pattern. TYPE 3: Adjust deflectors in flow divider or spinner-disc speed (e.g. GVM). These type of spreaders allow for adjustment of (1) the deflectors altering drop location onto the spinner-discs or (2) spinner disc speed (courtesy of GVM). Move the center deflectors inward. Move the center deflectors outwards, towards the machine center, on both sides. Ensure feed gate is level and free of debris. If available, ensure hillside divider is inserted and properly mounted; square and centered. Make sure divider is mounted level and centered. Move the delivery chute away from the bin. Adjust the spinner blade tips in the same direction of spinner rotation. Move delivery chute to the right. Slow the spinner speed down slightly. Figure 9: Adjustments 1–3 for a right skewed distribution pattern (reverse for left skewed pattern) on a single spinner fertilizer applicator (image is for spinners that rotate counter-clockwise). The authors would like to thank Glen Arnold, State Field Specialist, OSU Extension; Sam Custer, Extension Educator (ANR)–Darke County, OH; Craig Fenstermaker, New Leader Product Manager, Highway Equipment Company; Larry Hoover, Engineering Manager, GVM Inc.; Dr. John Long–Extension Ag Engineer, Biosystems and Agricultural Engineering, Oklahoma State University; Dr. Brian Luck–Assistant Professor and Extension Specialist, Biological Systems Engineering, University of Wisconsin-Madison; Dr. Gary Roberson–Associate Professor and Extension Specialist, Department of Biological and Agricultural Engineering, North Carolina State University; Dr. Erdal Ozkan–Professor and Extension Specialist, Department of Food, Agricultural and Biological Engineering, The Ohio State University; and Eric Richer, Extension Educator (ANR)–Fulton County, OH, for their reviews and assistance in this publication. ASABE S341.4 (2015). Procedure for Measuring Distribution Uniformity and Calibrating Granular Broadcast Spreaders. Fulton, J. P., & Ogburn, C. (2010). Calibrating Dry Broadcast Fertilizer Applicators. Alabama Cooperative Extension System, ANR-0724, 1–4. International Organization for Standardization. (1984). International Standard ISO 5690/2–1984. Switzerland.